I'm convinced also that the sweetness increases when it's a prayer request granted for another person. Prayer straddles our lives both on earth and in heaven. All week I'm focusing on prayer. It’s important. I need to do better in my life, and I can’t imagine a Christian who doesn’t think they can do better at prayer either. This series of 'prayer machinery of heaven' is inspired by that thought. 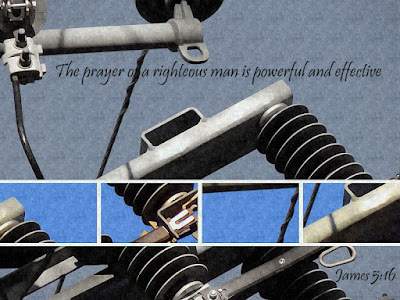 Please enjoy this scripture photo I made of the machinery of prayer. Under that will be some further resources on prayer suggestions. Monday I suggested praying for the persecuted and missionaries around the world, with some resources to check out along those lines. Tuesday I suggested praying for our elders (pastors, deacons, teachers, etc), again, with resources. Today's let's let's pray for each other.